On January 12th, an earthquake devastated the nation of Haiti causing the nations of the earth including America to respond with humanitarian aid. Before the earthquake, Haiti was considered the poorest nation in the western hemisphere with 54% of Haitians living in abject poverty (Central Intelegence Agency, 2009). After the earthquake, the situation went from dire to impossible. The compassion of our nation was moved and movie stars and former presidents were stirred to action. Just fifteen days following the Haiti earthquake, $528 million had been given to over 40 US non-profit agencies (Wallace, 2010). That was even before the odd couple united of Presidents Bush and Clinton forming a fund for Haiti raising $37 million (BBC News, 2010). At this point, it is probable that donations would total in the billions. With all of this money, the food problem has been solved and the people have been fed, right? On February 2nd, almost a month after the quake, with the aforementioned over half a billion dollars raised by those 40 non-profits, The New York Times reported that only 639,200 people had been fed by the World Food Program—just 32% of the estimated two million people in need (THOMPSON, 2010). Okay, so I am not a math guy, but lets figure this up: if a half a billion dollars was raised by this point (and it is actually more than that) then each person’s meal cost $782.23. Now either the World Food Program was feeding the people filet mignon and caviar, or something is devastatingly wrong with the way food is being distributed in Haiti. A few days after the earthquake, the US military began airdrops with food and water outside of Port-au-Prince, Haiti. Defense Secretary Robert Gates was skeptical about the success of such a mission, “It seems to me that, without having any structure on the ground in terms of distribution, that an airdrop is simply going to lead to riots as people try and go after that stuff.” (Shaugnessy, 2010) I interviewed a native-born Haitian, James Adams. He is the director of One Heart Ministries a ministry working in Haiti feeding the poor and discipling pastors. He was concerned about the food drops, “The army sent in their helicopters and they just started dumping rice and beans. So, all these people are running all over the place. They are almost killing each other for the food. It’s helpful that they are giving them the food, but what value do you give to that people? Someone looking at that clip from another place would look at those people like dogs.” (Adams, 2010) When food is distributed in this way, food riots have been a serious problem, so much so, that most organizations are now afraid to even distribute food at all. 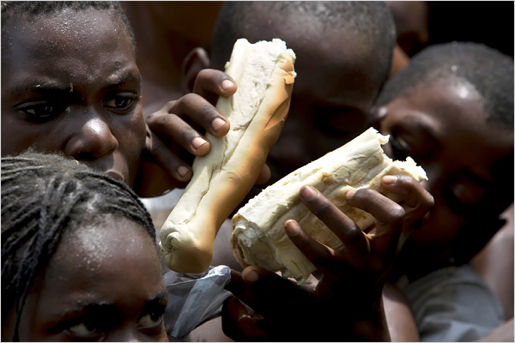 Muller Bellegarde a thirty-year old Haitian remarked of one of the food drops, “They treat us like animals, they beat us but we are hungry people.” (Fox News, 2010) So, what is the solution? How can we treat the Haitian people with dignity but still meet the urgent demands of this great need for food? A Fox News article a couple of weeks after the earthquake recognized, “Many said they appreciate the international response and under no circumstances want the Haitian government to handle aid deliveries, but suggested Haitian churches could provide more orderly and respectful venues for distributions” (Fox News, 2010). James Adams of One Heart Ministries employs this strategy in his food distribution in Haiti, “So, I find the best way to [distribute food] is to connect with local pastors and leaders that already know their people.” While other organizations like the Red Cross are afraid to go in to Haiti, his ministry, even with limited resources, has already done six food programs feeding around 10,000 people. So, it seems that a practical solution to the mess of the food distribution in Haiti is to distribute the food through local churches. What does the Bible have to say about this issue? When the first revival swept through Jerusalem Luke records an interesting action of the early church, “And all who believed were together and had all things in common. And they were selling their possessions and belongings and distributing the proceeds to all, as any had need.” (Acts 2:44,45) It seems like the early church was a storehouse for believers that were in need. In fact, in Acts 6 the Hellenists complained that the Hebrew widows were getting preference over food distribution. So, the church is to be the source for the poor in our midst. In a crisis, like the Haiti earthquake, the church is even more critical. When a severe famine crippled the early Jerusalem church, it was the church from other regions that sent money to the apostles to buy food for those hungry in the Jerusalem congregations (See 2 Corinthians 8). So, we have a clear picture that the early church was the storehouse in times of crisis. I hope that in our day, it will be no different.